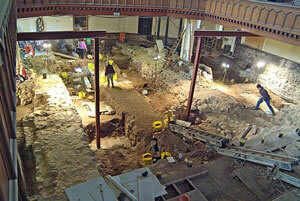 Redevelopment of the East Kirk of St Nicholas, Aberdeen to facilitate a community development, has allowed a team from Aberdeen City Archaeological unit to excavate an area 400m square to a depth of 4.3m within the church. St Nicholas is Aberdeen ‘s medieval burgh church and the first reference to it is in a papal bull dated 1157, although it is very likely that it predates that document. The excavation team includes 12 professional archaeologists from all over the UK as well as Spain and Egypt. Several have extensive burial archaeology experience as well as forensic and human skeletal material qualifications. The site is also a training excavation for archaeology students and local enthusiasts and has been visited by several thousand people who can view the excavation through a ground floor window and a gallery over the dig. Nearly 100 groups including 60 school classes have taken guided tours of the project. 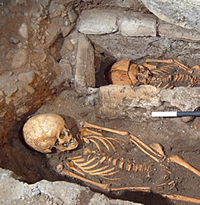 So far nearly 500 burials have been excavated, dating from the 11th to the 18th centuries. These included well- preserved coffins and fittings as well as burial garments including silk caps and many examples of silk trimmings. Several family burial areas have been excavated and we hope that DNA analysis on the well-preserved individuals will determine the exact nature of these relationships. One coffin in a family burial area of at least 7 individuals had four 17th-century coins attached to the lid: the latest of these was a Dutch doit, a small denomination coin in circulation in Scotland during the late 17th century. This coin was dated 1691.The individuals include many children and older adults: this area of the church was the most expensive to be buried in and therefore is expected to include the upper echelons of Aberdeen society. The skeletal analysis will be conducted by Paul Duffy from GUARD who has visited the excavation regularly to do an initial scan of the material. Diseases recognised so far include syphilis (in a post 15th-century burial), tuberculosis and many examples of osteoarthritis. Four individuals display blunt force trauma to the head including one with at least four wounds made by a blade.Structural remains appear well preserved. The 19th-century superstructure is supported on the footings of the 15th-century church walls. Two sleeper walls from that same period indicate where 1.5m diameter pillars held the weight of the 15th-century. Some floors survive and earlier walls and floors are just appearing. The 15th-century sleeper walls incorporate elements of earlier church walls probably including some from the 12th-century building. Fragments of that structure can still be seen in the standing building and a mid-12th century coin was found in a wall foundation during an excavation in Collison’s Aisle in 1974 conducted by (now Professor) John Hunter. Archaeologists on this site will be keenly looking for dating evidence as these structural remains are carefully dismantled in the next few months. Large quantities of reused stonework several with masons’ marks and window glass will allow reconstructions to be attempted. From May through September, the Kirk is open each day of the week. Tours of the excavation are at 10.30 and 11.30am, 1.30 and 2.30pm. More information on visiting the Kirk is available on their website or to find out more about the archaeology, log on to the weekly diary.